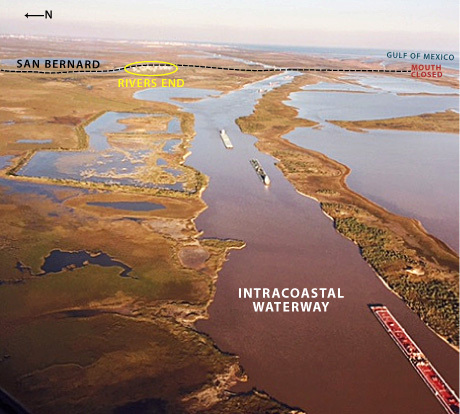 Looking towards Freeport, the Intracoastal Waterway shows numerous barges waiting in line to pass through the Brazos River Floodgates located approximately 4 miles to the east. Barges on the ICW, when fully loaded, can draw up to 9 or 10 feet. The currents are stiff around the East and West Floodgates because of the Brazos River that flows between them. When boating through to Freeport use caution and be aware of the currents.